Dried Fruit That’s Just That: FRUIT. 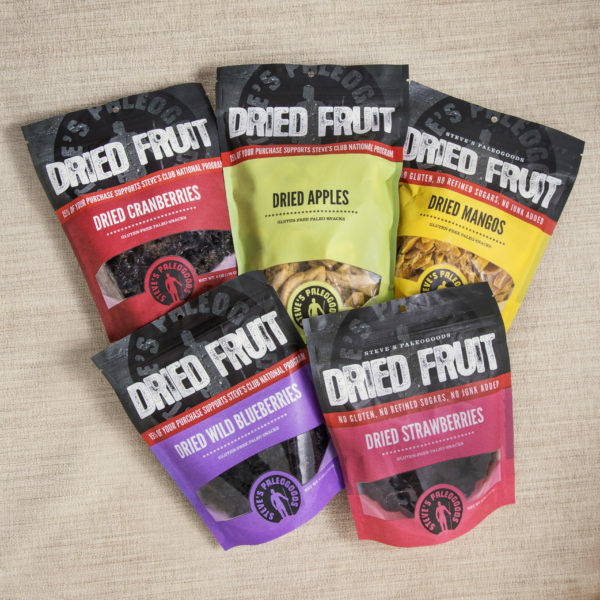 Our Dried Fruit Sampler is a great way to try them all! It’s summer time and fresh fruit is delicious. Grab an orange and a pack of PaleoStix and you have yourself a balanced lunch or snack. For those times when you are on the go and looking for clean carbs, Dried Fruit is a great option. It’s compact, convenient and loved by kids and adults alike. At Steve’s PaleoGoods, we are proud to say our Dried Fruit makes snacking naturally sweet with no added agents or sweeteners. Some have added sugars, preservatives and color enhancers that make them anything but natural. Our fruits are darker than their fresh counterparts because we refuse to add coloring agents. If your dried fruit looks like a bag of candy, it’s time to check the deck for ingredients you don’t want or need. The only way to be sure there’s no hidden sweeteners in your dried fruit is to check. At Steve’s PaleoGoods, we use apple juice concentrate in a few of our Dried Fruits to combat the tartness of cranberries and add moisture to Strawberries and Blueberries that without it would be too dry. Our Mango, Pineapple, and Apples are just that, with only one ingredient in the deck. Look for ingredients ending in “ose” AKA sugar: dextrose, fructose, glucose, lactose, maltose or sucrose. Syrup? Another popular sugar alias. All dried fruit will have sugar content because of the naturally occurring sugar found in fruit. Food manufacturers are not required to disclose natural content versus added sugar content. Steve’s PaleoGoods is proud to disclose that we have NEVER EVER added processed sugar to our Dried Fruits. While you are checking the deck on your dried fruit for sugar content, don’t forget to check for sulfur dioxide. It’s an agent that’s been used in the fruit drying process for years, and can trigger an asthma-like reaction in some people. Long before modern man and mass transportation made produce readily available 12 months of the year, drying was the only way to preserve fruits and vegetables for the “off season.” Bacteria and enzymes need water to break down a food, so removing the water works as a natural preservation method. Drying fruit decreases it’s size by over 50%, taking out all the water and leaving vitamins, minerals and the nutritional content. Smaller amounts can be conveniently packed for on-the-go eating when space for nutrition is at a minimum. Think of eating dried fruit as a way of getting more by eating less. Since drying the fruit decreases the size by half, it also doubles the caloric content per cup. Think about a cup of fresh strawberries in relation to a cup of dried. Reducing the size of the strawberries will double the actual portion and the calories. Many brands add artificial sweeteners and the calorie count continues to grow. Looking to replenish your body quickly after a long hike or period of exertion? Grab 3-4 of our Dried Strawberries and get the job done fast. They are much less filling than regular strawberries due to the decreased water content, perfect for recovery. Like all foods, dried fruit is not created equal. When it doubt, check the deck and be sure of what you are consuming. Be wary of bulk bars where you scoop your own fruits, as those ingredient labels won’t be as accessible. Play it safe and order some Steve’s PaleoGoods today! 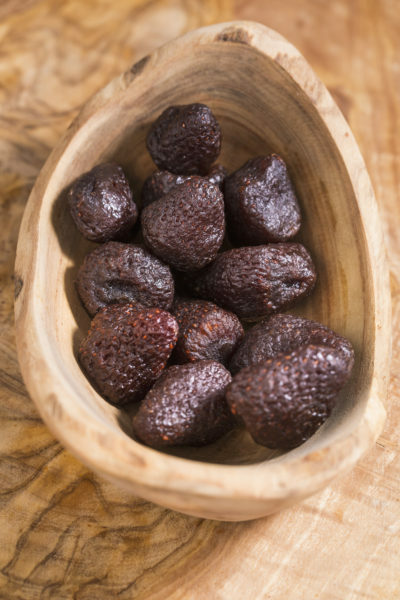 We are proud to produce Dried Fruit that makes your life naturally sweet.